John and I eat an absurd amount of pizza... frozen pizza, pizza rolls, Pizza Hut, etc... we don't discriminate - it's terrible, really. In attempt to health-ify our lives (like that? health-ify? 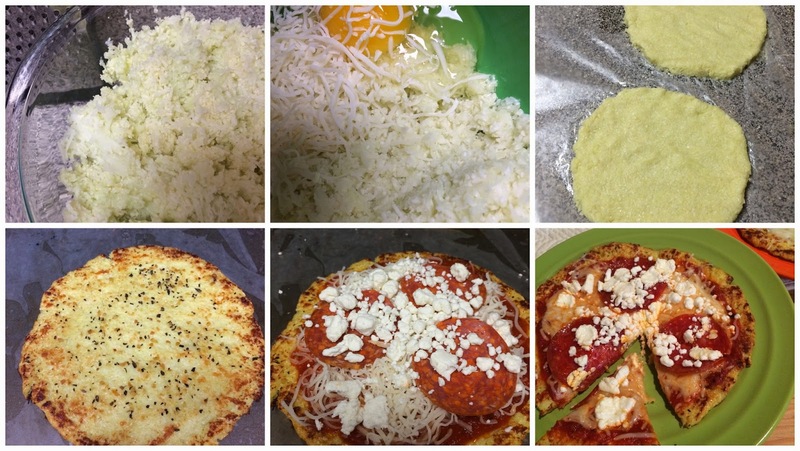 totally just made it up - bet you couldn't tell), we decided to try a cauliflower crust pizza. We loved the cauliflower cheese sticks, and quite honestly, the pizza was just as good! After eating a few slices, John even said that he might prefer the cauliflower crust to the real thing... now if only you could order out and get this (I'm efficient like that)! 1. Begin by making cauliflower rice. I used a cheese grater, but if you have a food processor, that is a much faster and cleaner method. After ricing your cauliflower, put the rice in a microwave safe bowl and microwave for 5 minutes. 2. After microwaving your cauliflower rice, mix in one egg, and 1/4 cup of shredded cheese. 3. Form the mixture into pizza crusts on wax paper. Keep in mind that you want the crust to be thin enough to toast all the way through, but thick enough to not fall apart when you're eating a slice (mine was probably 1/4-1/2 inch thick). 4. Preheat your oven to 450 degrees WITH your pizza stone or baking sheet inside the oven. Once your oven is preheated, pull out the baking sheet and put the wax paper with the crusts on top and bake for 20 minutes, flipping half-way through. Be very careful when flipping to not break the crust before it is done baking. 5. Once your crust is toasted to your liking, add you desired toppings, and bake for 10-15 minutes, or until done. You'd be surprised how when finished baking the crust holds together like normal pizza! This looks so good! I'm going to have to make this. My hubby is diabetic and this would be perfect for him. It's crazy to me how much this looks like real crust! I think sometimes when you do substitutions for things if it looks totally off, it kind of throws off your palette to begin with but this looks so good! My mom is gluten-free so I know she's tried this crust before and also really likes it! You are so creative! I love this! Totally trying this - Colin is a pizza addict and my waistline is too so I would LOVE a healthier version! Girl, we could be twins. We had pizza twice this weekend. Where do you come up with this stuff? I've got to try it!!! Thanks so much for sharing this! Can't wait to give this a try. My husband I also consume (in my opinion) too much pizza! This sounds like a great alternative, and your getting more vegetables in there! yum yum yum. i have been wanting to try this, but scared. your post has inspired me to try it! 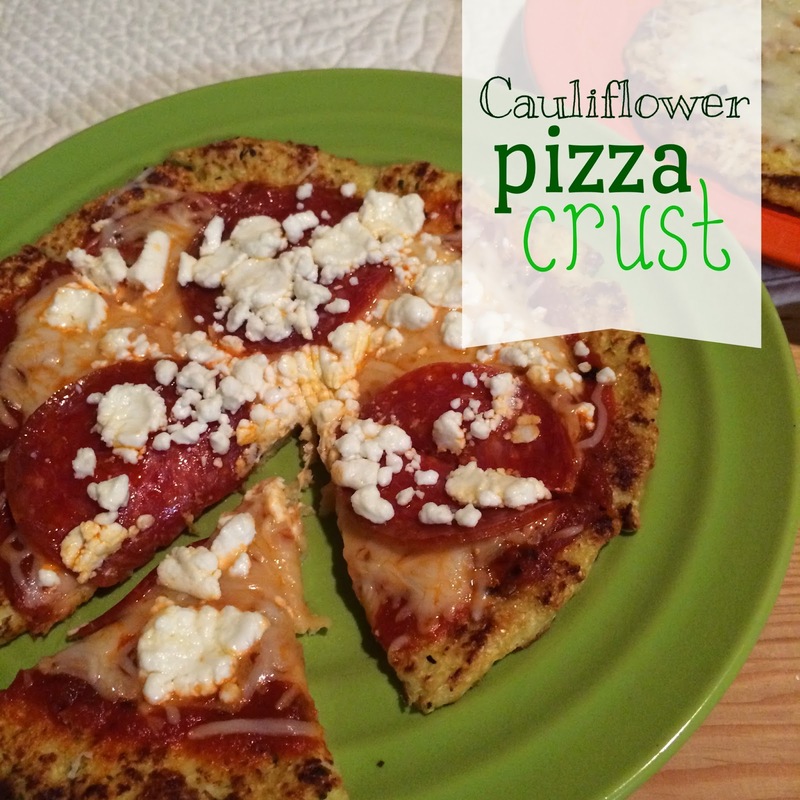 I am not the biggest fan of cauliflower but if it tastes like pizza sign me up!! Can't wait to try this out! you had me with your very first sentence!! We eat a ton of pizza! This is definitely on my to do list! Going to the grocery store today! I've seen this around on Pinterest, I'm really intrigued :) May have to try soon! okay my stomach is seriously growling. totally trying this!! Nom nom. I wish I had this for lunch today! mmm I have not tried this yet but I want it for lunch...like today! haha Thanks girl! One of my friends made this the other day and said it was delicious! I wonder if I could talk my hubby into this... thanks for sharing, girl! That looks good! I'm going to have to try that! We love trying stuff like this so I will definitely be giving it a shot. I might have to give this a shot! I've seen it before, but it just seems so odd. And, I love pizza I'd eat it every three days if I could. I've seen this before and really wanted to try it, but totally forgot! Thanks for the reminder! As much as I love bread, I think this would be a fantastic, healthier alternative. Thanks so much for linking up with us at Delicious Dish Tuesday! We hope you'll come back again next week and share another tasty recipe with us! I make a similar cauliflower crust and we LOVE it! it does require a lot of time compared to a frozen one but its worth it! This looks awesome! I can't wait to make this for the hubs! Thanks for the recipe girl! I am so sorry I have been MIA lately! Thank you so much for your sweet comments over the last couple of weeks! Hmmm, this intrigues me. I have a cauliflower in the fridge right now, maybe I'll try it!